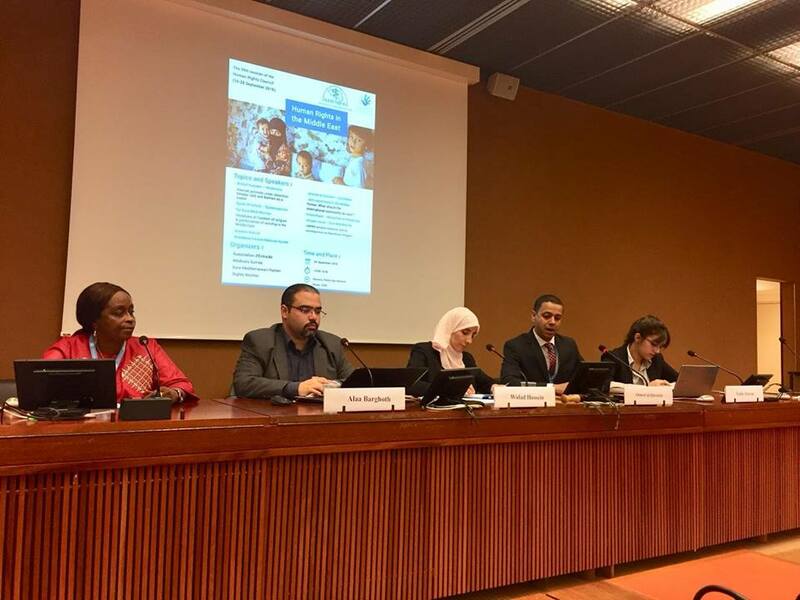 Geneva - People in the Middle East should enjoy the right to freedom of religious practice and the right to freedom of opinion and expression, and to association, especially in the Palestinian territories, the United Arab Emirates, Bahrain, Yemen and Saudi Arabia, said the Euro-Mediterranean Human Rights Monitor. People in the Middle East are victims of serious violations of the right to freedom of religious practice, even in those countries that are described as relatively stable, said Alaa Barghouti, Euro-Med’s researcher. He further warned against evoking religious feelings in the Middle East as a result of denying them or restricting their religious rites, which will only lead to serious deterioration of human rights in the region, fueling hatred and threatening peace. Barghouthi spoke of restricting access to holy places for Muslims, particularly in Saudi Arabia and the Occupied Palestinian Territories, being the two most important places of worship for Muslims. Regarding Jerusalem, Barghouthi said that since US President Donald Trump’s decision to relocate his embassy from Tel Aviv to Jerusalem, the Israeli authorities have stepped up violations against Palestinians in East Jerusalem by escalating their policy of home demolitions and detention. Euro-Med Monitor published a detailed report on Israel’s violations during last August in Jerusalem alone. The report revealed that Israel has adopted a racist policy against the population in the city, including by banning Palestinians from visiting Al-Aqsa Mosque without any legal justification, said Barghouthi. Regarding Saudi Arabia, since Saudi Arabia announced the the cutting of diplomatic ties with Qatar in June 2017, Qatari nationals and residents wishing to perform Hajj or Umrah have not been excluded from the arbitrary measures Saudi Arabia has taken against Qatar, stated Barghouthi. Since the beginning of the Gulf crisis, Euro-Med’s team has recorded about 200 complaints concerning the imposition of travel restrictions on Qatar by Saudi Arabia, added Barghouthi, pointing out that tens of thousands of Qataris and Muslims residing in Qatar have been reluctant to perform Hajj and/or Umrah because of difficulties and obstacles placed by the Saudi authorities. As a result of these obstacles, some 20,000 Qatari citizens or residents could not perform Hajj, Barghouthi noted, referring also to cases where Saudi opponents were denied visas to enter Saudi Arabia even for Hajj or Umrah. The United Nations Relief and Works Agency (UNRWA) has taken measures to reduce its services in the Palestinian territories after US completely stopped funds to the Agency, said Ghada Al Rayyan, Euro-Med’s researcher. Reducing or ending UNRWA services threatens to close hundreds of schools and medical clinics serving Palestinian refugees in the occupied Palestinian territories, Al Rayyan said, calling on the international community to provide protection for the Palestinian refugees, and ensure legal, financial and moral support for UNRWA. All countries in the world, especially the developed ones, are urged to provide urgent financial assistance to UNRWA to compensate for its budget shortfalls and cover the costs of its humanitarian and operational programs, stated Al Rayyan. The international community should take a decision to ensure adequate financial resources and allocate a regular budget for UNRWA, rather than relying on the voluntary contributions of donor countries. Yemen is witnessing the largest humanitarian crisis in the world, said Ahmed Quraishi, the journalist and expert on the Middle East, stressing that the focus should be on resolving the conflict in accordance with Security Council Resolution 2140. All parties to the conflict bear responsibility for the human rights violations that are still rampant in Yemen, stated Quraishi, especially in light of the sea-land blockade and denial of humanitarian access by the Arab Coalition. As long as the Houthi group fails to engage in constructive peace talks leading to the end of the conflict in Yemen, the crisis cannot be resolved, stressed Quraishi, adding that the Group did not send a delegation to participate in the ongoing talks in Geneva. Regarding social media activism in the Middle East, Widad Hussein, Euro-Med’s External Relations Officer, spoke of the arbitrary and illegal arrests against activists in the UAE and Bahrain as an example. Over the past seven years, the United Arab Emirates (UAE) and Bahrain have been systematically committing stark violations of the rights of individuals active on social media outlets. The two countries use broad legal provisions in their penal codes to convict people who criticize the state, and then punish them for activities related to opinion, where verdicts sometimes amount to life imprisonment, stated Hussein. The UAE authorities use terms such as “fighting terrorism,” “disrupting public order” or “religious values” to suppress the opposition. They also rely on broad and vague laws that allow conviction of peaceful opposition, equating it with terrorism, said Hussein. In February 2011, the Bahraini authorities started to follow a policy of repression against the opposition on a systematic basis, using all technical and security capability to prosecute human rights activists and political dissidents in the country, added Hussein. Ghada Al Rayyan, Euro-Med’s researcher. The Bahraini policy had a difficult impact on the activism of the civil society in the country, thus limiting the efforts made by some brave individuals who put their personal security at risk in order to raise their voices. Widad Hussein called on the Bahraini and Emirati authorities to stop their repressive policies against political opponents and opinion activists, and to hold accountable those responsible for continuing torture inside prisons and detention centers. She also urged the two countries to stop military trials of civilians, revoking nationalities of dissidents and their families, and criminalizing activists for their criticism of the authorities in the country.